From left, Lawrence Bonchek, M.D., Lisa Bonchek Adams ’91 and Rita Bonchek, Ph.D., following the dedication. The view from the top of the Lisa Bonchek Adams Auditorium in Kaufman Hall. Franklin & Marshall College unveiled a pristine space in the center of campus Saturday afternoon at the dedication ceremony of the Lisa Bonchek Adams Auditorium in Kaufman Hall. Donated in honor of Lisa Bonchek Adams '91 by her parents, Drs. Rita and Larry Bonchek with pride, admiration and love. 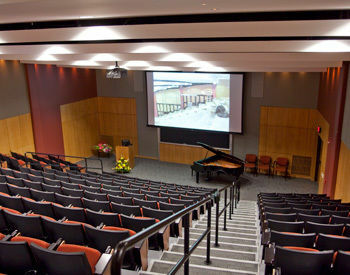 The ceremony marked the culmination of the transformation of Kaufman Hall into a radiant auditorium, complete with theater technology, cushioned seating and warm surroundings. Members of the College community joined President John Fry and the Bonchek family to celebrate the new addition. Lisa Bonchek Adams is a survivor of cancer. * She writes about her experiences as a wife and mother of three with cancer in a blog, lisabonchekadams.com. She spoke at the ceremony about her love of Franklin & Marshall, where she met her husband, Clarke Adams '92. Others providing remarks at the ceremony were Fry, Larry Bonchek and Joel Eigen, the Charles A. Dana Professor of Sociology, a mentor and friend of Lisa Bonchek Adams. Paige Adams, daughter of Lisa and Clarke, performed a piano solo, Midnight Escapade by Melody Bober. She received a standing ovation. 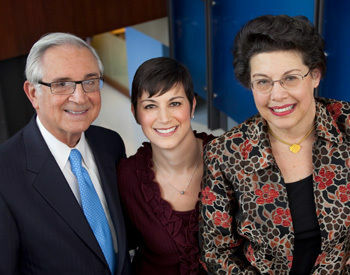 Larry and Rita Bonchek have been longtime supporters of Franklin & Marshall. They founded the Bonchek Institute for Reason and Science in a Liberal Democracy, which seeks to foster an appreciation for the importance of reason, skepticism and the scientific method in maintaining a liberal democracy. They have also contributed significant donations to support the Bonchek College House and the Bonchek Lecture Hall in the Barshinger Life Sciences & Philosophy Building. * Update: Lisa Bonchek Adams passed away on March 6, 2015.